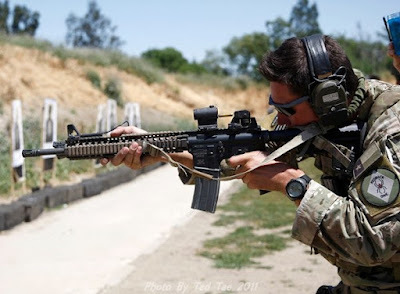 In the tactical shooting world there are seldom times that a right handed shooter needs to be a 'molly-dooker' (Australian slang) or left handed. So why are more and more shooting instructors, me included, teaching this low percentage skill to our modern war fighters? Surely it makes more sense to train someone to a better standard on their natural side rather than spend time trying to teach them to become a left hander, right!? Well, it's partly true. It definitely makes a lot of sense to train someone to a higher standard on the natural side before training them to become a steely eyed freedom fighter on their non-master or support side. So when would I ever need to switch the gun to my non-master side? And even if I did, why would I need to do it so fast? These are the typical questions that I get asked when training students on this advanced technique. The answer though really lies with the task that needs to be performed by the individual or the unit. For example, an assault team that is dynamically entering a structure using the principle of speed to their advantage in order to maximize surprise, left handed techniques will seldom if ever apply. This is due to the short duration of the mission and use of overwhelming force ratios. This type of approach is frequently used also during hostage rescue or recovery type operations. But, with the emergence of new enemy tactics, techniques and procedures (TTPs) designed to combat our modern warfare doctrine, we the good guys need to adapt and develop new TTPs or Standard Operating Procedures (SOPs) to counter our enemies. This struggle or tug-of-war as it were, has been going on for centuries. How this relates to being a 'molly-dooker' is this. Being able to safely handle and operate the weapon on both sides of the body confidently, provides the shooter with added security when performing CQB/MOUT (Close Quarters Battle/Military Operations in Urban Terrain). Being able to switch the weapon from natural to support shoulder, mount the weapon and accurately engage a target quickly and decisively is a real advantage to the shooter. Shooting from the support shoulder and from support side cover will provide the shooter with more security as he will be less exposed to the threat. These types of scenarios typically present themselves during urban warfare or MOUT operations. Support side shooting techniques can provide the commander with added force protection and flexibility, allowing him to clear enemy held strongholds more methodically while ensuring that the security and protection of his men is still maintained. This is particularly useful when conducting night operations using NVG's and Lasers. There is another reason for shooting left handed, and that is to maintain combat effectiveness while injured. In line with the principles of Tactical Combat Casualty Care (TCCC), if injured during combat operations, an individual should apply self aid and attempt to regain the initiative and continue the fight if possible. In situations like this, the shooter may need to employ the primary weapon from the support side should he sustain injuries precluding him from using his natural side. Some of our advanced weapons manipulations training will involve the students handling and operating the weapon with the support hand and shooting from the support shoulder. This training includes support hand manipulations where the student will need to rectify malfunctions and reload the weapon using only the support hand. We always stress the necessity for speed and accuracy of movement during the drills. This is to breed the instinctive nature of weapon handling and shows us that the student has in fact learnt the drill, committed the sequence to the subconscious and is able to perform the drill on demand under stress.